NOTE: I was fortunate enough to attend a rare 70mm screening of Paul Thomas Anderson's The Master on Thursday August 16, 2012 at the Music Box Theatre in Chicago, Illinois. In attendance were writer/director Paul Thomas Anderson and one of the film's actors, Kevin J. O'Connor (both of whom are pictured with me here). The key to the success of Paul Thomas Anderson's The Master doesn't come in its mammoth achievement of being shot on 70mm film or its carefully constructed parallel origin story of L. Ron Hubbard's Scientology practices. 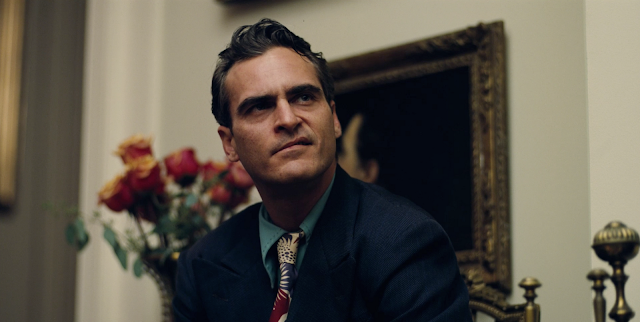 Rather, that success is embedded in an intimate scene: a single shot close-up on alcoholic war veteran Freddie Sutton (an unforgettable Joaquin Phoenix) during a "process of time" session with Lancaster Dodd (Philip Seymour Hoffman in prime Hubbard form). 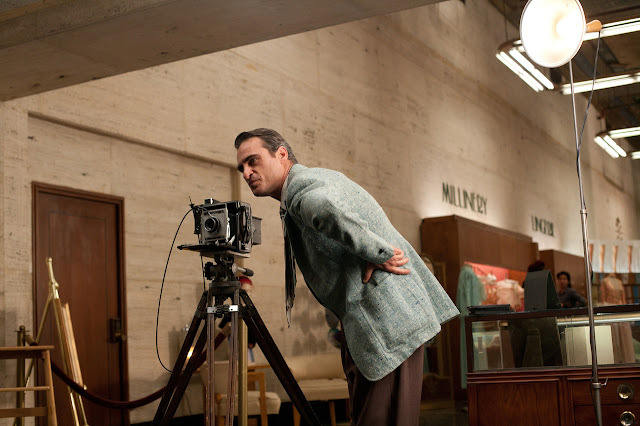 Up until this scene, the character of Freddie dutifully performed the task of delivering the film's dark laughs (from publicly jerking off on a beach to using department store photographic developer liquid to concoct strong drink cocktails). But when this initial "process of time" scene--and more importantly that single shot close-up of Freddie--begins to unfurl, Anderson's true concerns with his seductive material (the patterns and rhetoric that make up a cult) immediately beam with vitality. As Lancaster relentlessly asks Freddie a laundry list of broad and repetitive psychological questions (e.g. "Are you thoughtless in your remarks? Do your past failures bother you? "), Freddie unravels in front of Anderson's camera. Desperately holding tears and blinks back, Freddie is absolutely riveting during these moments. And Phoenix the actor achieves a level of devastation and shattering power that cements his performance here as one for the ages. In a strange way, The Master is both Anderson's most straightforward story (a disillusioned veteran in 1950 suffers from alcoholism and accidentally slips into following a religious cult) and his most off-putting; off-putting because it is Anderson's least "cinematic" attempt. The extraordinary 70mm cinematography by Mihai Malaimare Jr. (who photographed 2009's best film, Tetro) is striking to look at but since almost all of the film revolves around stationary shots of people in conversation, the scope of the movie never feels grandiose. Gone are the underwater shots from the pool party in Boogie Nights or the impressionistic artwork transitions from Punch-Drunk Love. The Master does an impressive job of capturing the look and feel of the 50s but its slow churning plot prevents the film from embellishing in any substantial visual panache. And about that subject matter: Anderson never utters the word "Scientology" in his script (in the film the religious practice is referred to as "The Cause"). Still, Anderson is obviously skeptical (or at the very least concerned) with the power and functionality of religious organizations; a few lacerating scenes at some dinner parties of the wealthy show the cynical underpinnings behind such operations. The Master sometimes feels like a continuation of Daniel Plainview's outcry from the end of There Will Be Blood, a searing look into religious practices as being nothing more than a serious joke. This is not to say that Anderson is spiteful of any believers. The climax to his best film, Magnolia, literally called on some biblical exodus, with frogs raining from the sky. Again: consider the character of Freddie. After that initial soul cleansing (or soul crushing?) processing session, this unusual world is deflected and misshapen through Freddie's eyes--and therefore our own eyes. A brilliant, Kubrickian scene shows Freddie sitting in the corner of a rich dinner party and when the camera switches to his point-of-view (POV), we suddenly see all the female members of the party completely naked (that includes the pregnant and the old too). Because Freddie was already a lost soul when we first met him, his spiral into hypnotic loyalty and eventual disillusionment with "The Cause" is just as disorienting for us as viewers. If Anderson is trying to say anything with the Freddie character, it's probably that he is the extremity of our deepest yearning to act on impulse, with no inhibition. Ironically, that kind of blind fearlessness is what makes Freddie such a fresh and ripe target for "The Cause." 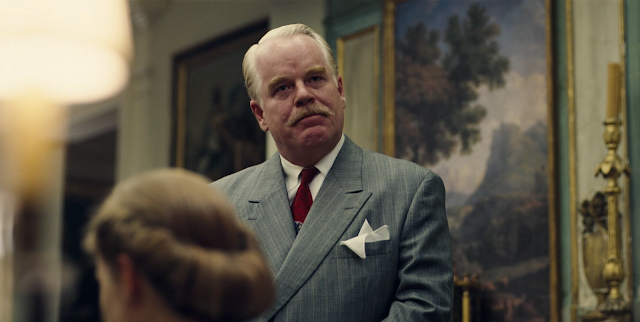 Regardless, the character of Freddie, because of Phoenix's staggeringly compelling performance, is the lifeline throughout Anderson's period drama. As of this moment, Phoenix is the frontrunner for the Best Actor Oscar. Some last second thoughts: The brilliant composer Jonny Greenwood (who also scored There Will Be Blood) achieves such unusual sound schemes, at times it feels like the film itself is an act of hypnosis. It's also good to see a strong female character in Amy Adams' Mary Sue Dodd, the behind-closed-doors Lady Macbeth to Lancaster. Finally, I really do admire The Master and feel it's one of the year's best films. I just don't know if it'll find its right and true audience anytime soon. The Master can be for Anderson what Eyes Wide Shut was for Stanley Kubrick's filmography: an important work of art in retrospect but not upon initial viewing. Good info!! I am finding an essay/ content writer expert. Do you know any writer like http://boxmachine.com/UserProfile/tabid/42/userId/67113/Default.aspx, who is able to write about any subject. Awesome post! This is very creativity and useful content. Thanks for giving the wonderful post. Well done!